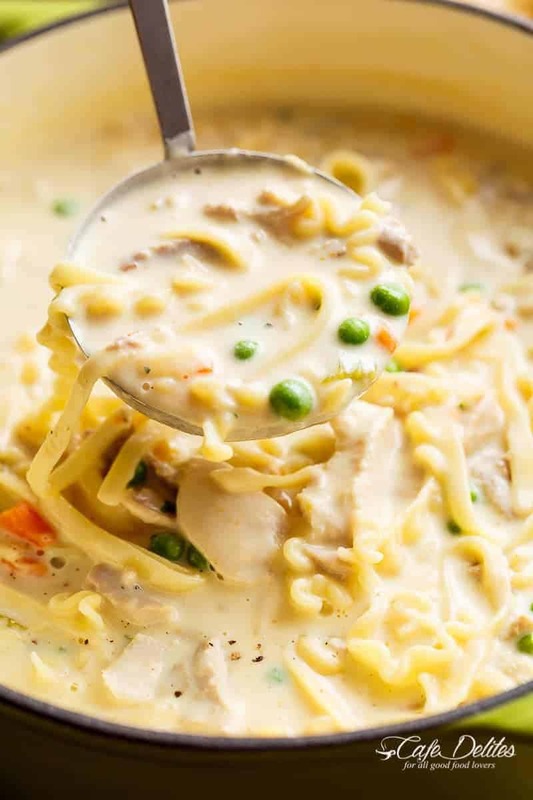 Super creamy Chicken Noodle Soup beats any soup any day. The perfect comfort food in a bowl, lightened up with half of the calories AND no heavy cream! 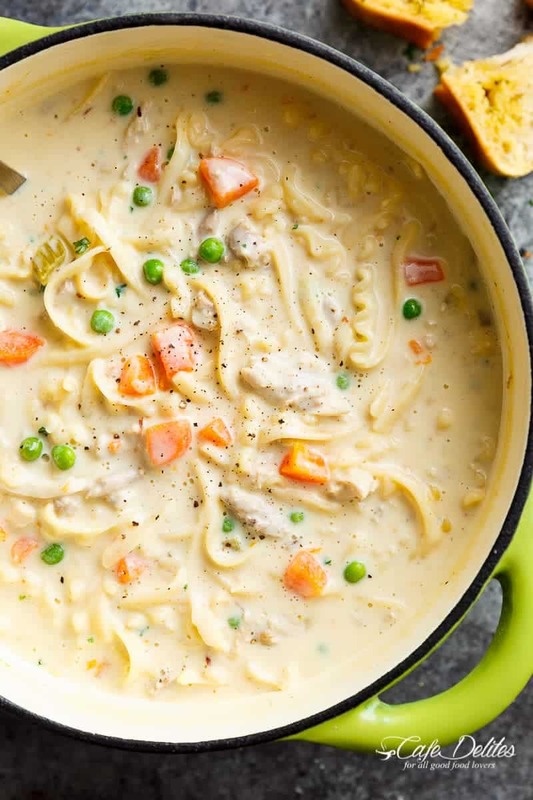 This Creamy Chicken Noodle Soup recipe is unlike any other, in its own amazing and unique way! Just over 300 calories per serve! ONE pot. NO cream. FULL of flavour. You won’t even miss the cream in this soup, mistaking it for a non-forgiving, fat producing bowl of calories. Its safe to say your family (including you, of course) will go back for seconds with this soup. Well, if they’re anything like mine, they will argue over who gets to soak up the very last drops of soup left over in the pot with toasted garlic bread. It’s not often I share a soup recipe on my blog. 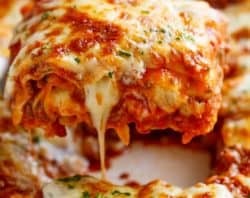 The last was the Slow Cooker Chicken Potato Corn Chowder and before that was this popular Roasted Tomato Basil Soup and this Slow Cooker Lasagna Soup. Because the weather has been SO miserable and cold, going backwards instead of forwards, soup has been coming out of our ears. This was the latest and BEST soup out of my kitchen. With creamy soups it is so easy to just throw in a bottle or three of heavy or thickened cream. So how do we get this ultra creamy soup with no cream? You’re going to use milk. Yes, it works. And none of this pre-made chicken and throwing it in the end business. No no no. We want FLAVOUR. Pure chicken flavour. Sear some succulent chicken thighs in a small amount of olive oil first. Throw in some flour and milk. Pour in some broth (or stock) and simmer your ingredients until soft and tender, and the chicken is easily shredded. Discard the bones; add the chicken back into the pot with noodles and milk and watch the magic happen. Thick and creamy soup. Instead of noodles, you can add in zucchini noodles for a lower carb option, or sweet potato noodles for a healthier option. Whatever you choose, this soup simmering away on your stove will have you impatiently drooling. Heat the oil in a large pot over medium heat. Sear the chicken thighs on both sides until golden (about 3 minutes each side). Add the onion, garlic, carrots, celery. Sauté for another 5 minutes until the onion becomes transparent and the celery begins to soften. Add flour, parsley, crushed bullion cube (or vegetable stock powder), and salt. Mix all of the ingredients through and allow to cook for a further 3 minutes. Pour in broth and mix everything together. Increase heat and bring to a boil for about 4 minutes (the broth will begin to thicken). Reduce heat, partially cover the pot with a lid, and allow to simmer for 20-25 minutes or until the chicken is cooked through. Add the chicken back into the soup along with the milk and noodles (or pasta). Bring to a boil and allow to cook for 6-8 minutes until the noodles are JUST beginning to soften. Taste test the soup and add extra salt or pepper or stock powder if desired to suit your tastes. Add the peas and continue to cook until the peas are cooked and the soup has thickened. *The milk can be substituted for 5 cups fat free half-and-half. Or 3 cups milk and 2 cups light cream. 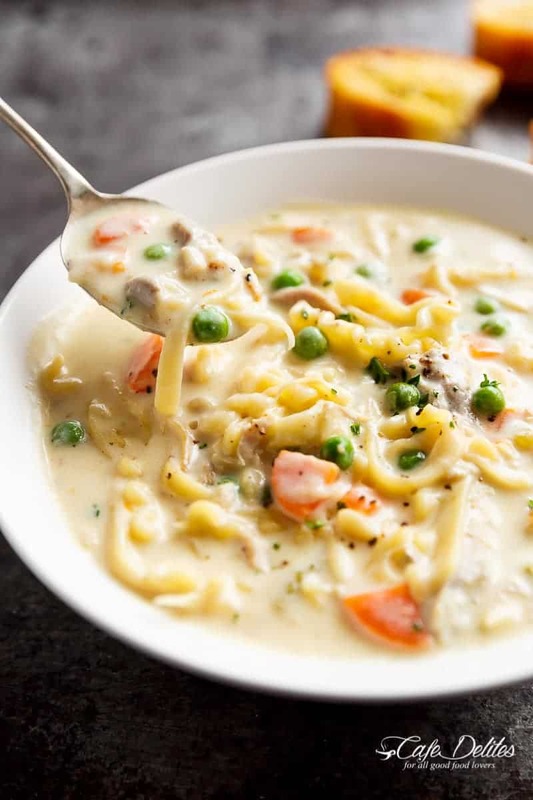 If your soup is too thick once it's finished, simply add more milk in 1/4 cup increments until reaching your desired consistency, Alternatively, if your soup is not thick enough to your liking, mix 1 tablespoon of cornstarch together with 2 tablespoons of extra milk. Pour the mixture into the soup and allow to boil for a few minutes to thicken, while stirring. Repeat for an even thicker soup! I love this! I am lactose intolerant so I used 3 cans of coconut milk (regular). I added an extra cup of chicken broth since coconut milk can sometimes get a lil thick. I’ve made it a few times and I’m obsessed. At this point, I use an extra carrot instead of celery (just don’t love the texture) and instead of adding a cube of bouillon, i do a half cup of water with a teaspoon of better than bouillon which I also use to make my broth. Thank you so much! Is there anything you could replace the flour with, possibly coconut flour ? Has anyone tried this? Made this for family and neighbors, everyone loved it! Neighbor said it was alot like chicken pot pie. Daughter, who is a picky eater, said this one is a keeper! I made it the day before and added noodles and milk just prior to serving, delicious!! I spent Christmas Eve at church and then afterwards at my niece’s Christmas party. Christmas day I went. To my son’s home and we watched his children open presents. They are one and three years old. I made this the other night. My husband said it was the best chicken noodle soup I’ve made. Keep in mind that I’ve made chick noodle soups with homemade stock, and homemade noodles, but this one was the winner. We both loved it. It’s seriously so delicious! I followed the recipe exactly. Can this be frozen if I make a big batch?? I’m atttepting this in my crockpot. I started it on the stove and transferred it to the crockpot after adding the chicken broth. I wll let you know how it turns out. I’m atttepting this in my crockpot. I started it on the stove and transferred it to the crockpot after adding the chicken broth. I wll let tou know how it turns out. Made this for dinner tonight. I used leftover grilled chicken thighs, and I omitted the chicken bouillon and the peas because I didn’t have them on hand. This was wonderful!! Next time I will add more carrots and celery. Thank you for the great recipe! This will be going into my regular rotation! What kind of noodles did you use in this recipe? I have never seen egg noodles like that before? They almost look like the sides of lasagna sheets? Yes, they are awesome in thicker soups like this one. They are mini lasagna noodle pasta and egg noodles in the soup. They are fun and delicious! I used gluten free noodles and flour. I only had almond milk, so I used that. It tasted amazing! I will make it again and again. Will probably use regular milk the next time, but I could not tell the difference with unsweetened almond milk. 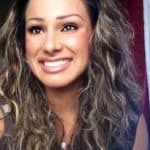 Kelly thank you for writing about almond milk! That’s a great substitution! Made this delicious, creamy soup tonight. Wow! It was awesome! This recipe’s a keeper in this house now. Great flavor and almost tasted like my wife’s chicken pot pie minus the crust! LOL! 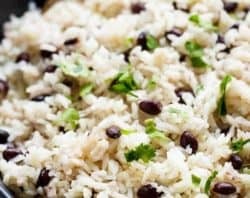 This by far is one of the best recipes I’ve tried, bravo! 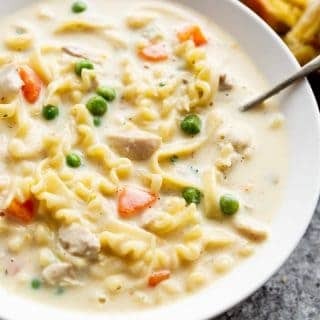 I did a few things different, my hubby smoked a whole chicken the other day so I shredded it then boiled the rest to make my broth, and I did a cup of heavy whipping cream with the milk, and i make my noodles separate because they tend to soak up all the juice when refrigerated everything else was pretty much to the recipe. It won over 4 out of 5 in my household (7 yr old grandson is pretty picky so I expected that) my 18 yr old who is extremely picky loved it so that’s a win in my book! 3 days later and we’re still warming up leftovers and eating it! I made this soup recently for my husband and my 17 months old son and oh my goodness !!!! My husband had 2 full bowls and my baby boy was obsessed with the soup !!! It was sooo rich and creamy ! The only thing I changed was I didn’t add celery because my family doesn’t like celery and instead of egg noodles I added bow tie pasta. Everything came out amazing ! Definitely will be my go to soup recipe ? 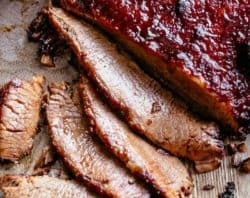 Has this or any variation of it been tried in the crockpot? I’ve never made cream soup either. Can this be frozen after for later use? Just shared this to my group on FB directly from your site! I’m making it tonight exactly by your directions. Thanks for posting! It’s getting cold here in the Midwest now so it’s PERFECT comfort food. One of the best soups! 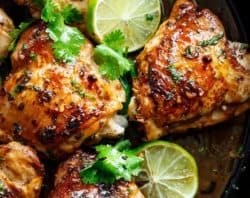 easy to make, and so delishious! Thanks for sharing! Is there a way to make this gluten free? I want to make it for a friend but it has flour and she can’t have that. Hi Becky! Yes definitely! Omit the flour, right at then end mix up about 2 tablespoon of cornstarch (gluten free) with 3 tablespoons milk. Add it in and allow it to simmer to thicken it up. Please let me know how you go! 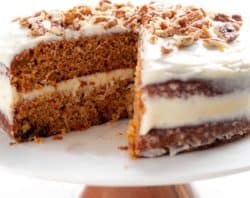 Would almond milk work in this recipe instead of cows milk? how much broth and what kind of broth? I just made this and it’s absolutely delicious. Ty. 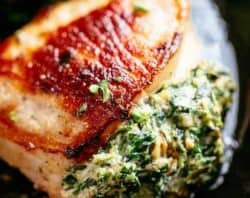 Have you ever tried making this with boneless, skinless chicken breasts? What kind of noodles did you use? I am going to try this tonight.. 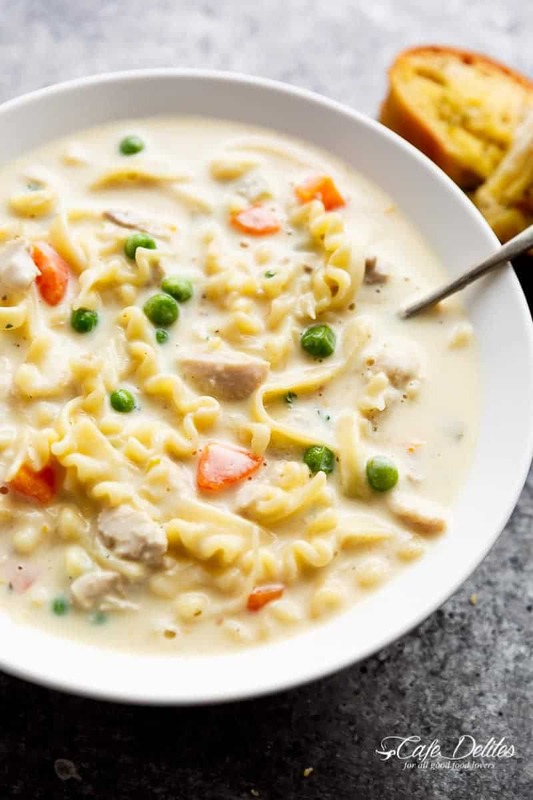 I have never made a creamy chicken noodle soup, but I made it the other night (minus the celery) and my family really liked it. Both my kids enjoyed it also! Thanks for sharing your delicious soup recipe! I just made this now for my family. I know my kids will love this!! Thank you! This is the perfect, hearty soup for a cool fall day!